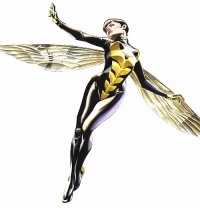 Janet van Dyne (known as Wasp) is a character from the Marvel Comics universe. Her home in New Jersey has a Clawfoot Bathtub. She takes a Bubble Bath in a Clawfoot Bathtub while Reading. This page was last modified on 29 August 2017, at 22:17.